Just Listed Lake Forest Condo! 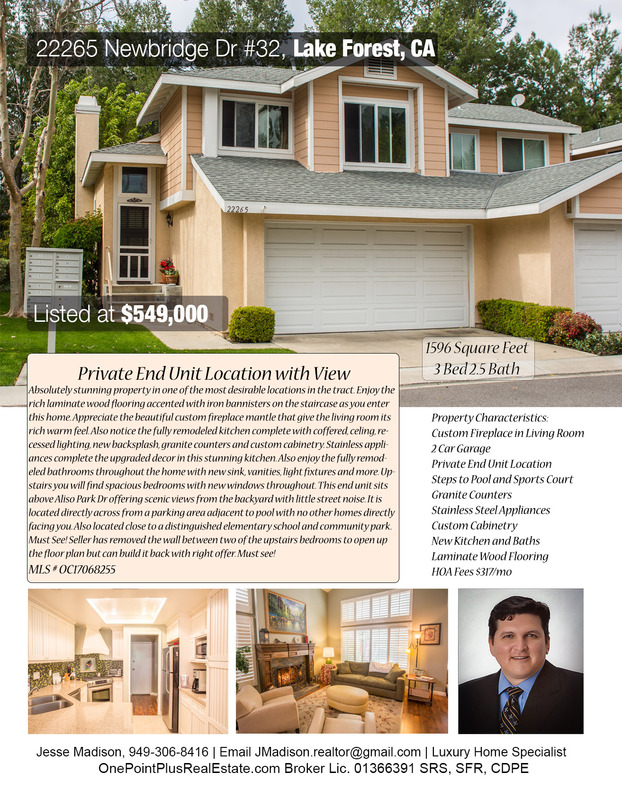 Absolutely stunning Lake Forest Condo in one of the most desirable locations in the tract. Enjoy the rich laminate wood flooring accented with iron bannisters on the staircase as you enter this home. Appreciate the beautiful custom fireplace mantle that give the living room its rich warm feel. Also notice the fully remodeled kitchen complete with coffered, celing, recessed lighting, new backsplash, granite counters and custom cabinetry. Stainless appliances complete the upgraded decor in this stunning kitchen. Also enjoy the fully remodeled bathrooms throughout the home with new sink, vanities, light fixtures and more. Upstairs you will find spacious bedrooms with new windows throughout. This end unit sits above Aliso Park Dr offering scenic views from the backyard with little street noise. It is located directly across from a parking area adjacent to pool with no other homes directly facing you. Also located close to a distinguished elementary school and community park. Must See! Seller has removed the wall between two of the upstairs bedrooms to open up the floor plan but can build it back with right offer. Must see! This home is located in the Grandview Tract. HOA fees are $317/mo. and include swimming pool, tennis court and sports court along with Club House for private events. Walking distance to highly desired Lake Forest Elementary School. Also walk to Montbury Park from this beautiful Lake Forest Condo. New Resident Welcome PacketTo help new residents get settled in and familiar with their City, the City has compiled a New Resident Welcome Packet filled with helpful resources. The Welcome Packet is free and is available at City Hall. Contact Calina Hon, Management Analyst, to arrange one for you! Pick up your free Community Resource Guide at City Hall or at the Sports Park and Recreation Center. The Guide is filled with helpful resources such as a City map, government phone numbers and websites, meeting dates, and information about community events. Click here to download an electronic version.